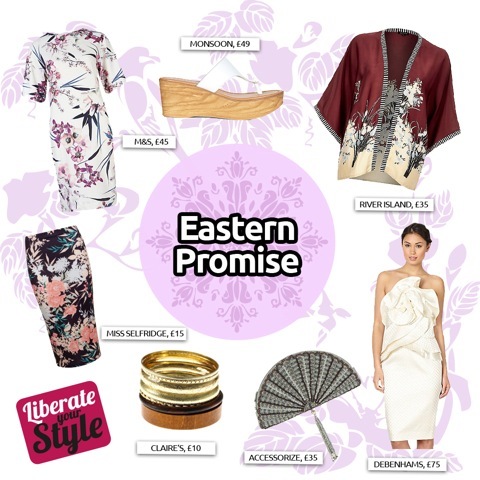 Take a trip East this Summer and embrace the hottest new trend with a little help from The Liberty. Team cherry-blossom florals, decadent silks and maxi dresses with obi belts, tasselled accessories and platform sandals for full on Orient glamour or, for an understated look, invest in a kimono jacket, which will look stylish dressed down with denim or up with your favourite LBD! Full of Eastern promise for your summer wardrobe, this ivory orchid print tunic dress (£45) from M&S captures the delicate side of the oriental trend. If you need a break from the heat on holiday or are looking for a chic way to keep out of the breeze, this silk print kimono top from River Island (£35) is the answer. Bored of summer florals and bold prints? This elegant origami style bandeau dress (£75) from Debenhams allows you to subtly channel the trend. Adopt a demure modern geisha look with this fun beaded and tassel detail fan clutch (£35) from Accessorize. Let this enchanting vivid print pencil skirt (£15) from Miss Selfridge speak for itself by teaming with a simple black or white camisole. If you choose to make a statement with exotic prints, keep accessories understated. These simple, wooden platform wedge sandals with thong-style strap (£49) from Monsoon will finish your look off perfectly while still giving a subtle nod to the East. To add an Eastern twist to any outfit, simply layer and stack bangles like these gold etched and wooden bracelets (£10) from Claire’s.